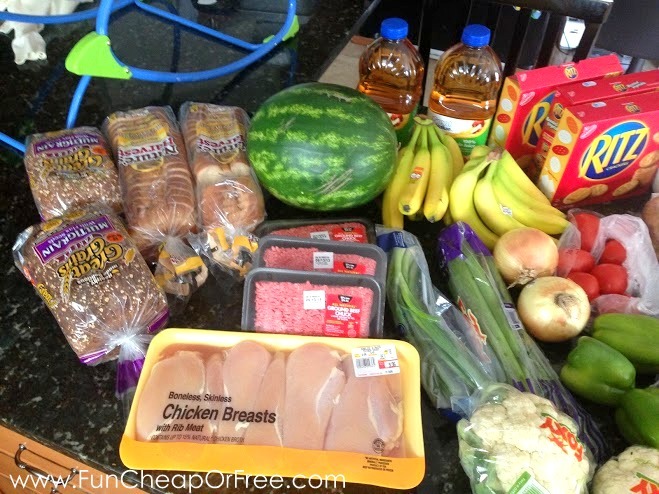 I ran sprinted to the grocery store and price-matched a great load of stuff. So, of course, I had to show you pics of my loot this week to (hopefully) motivate you all and remind you that you should NEVER have to pay full-price for your groceries! Plan your meals at LEAST 1 week in advance. 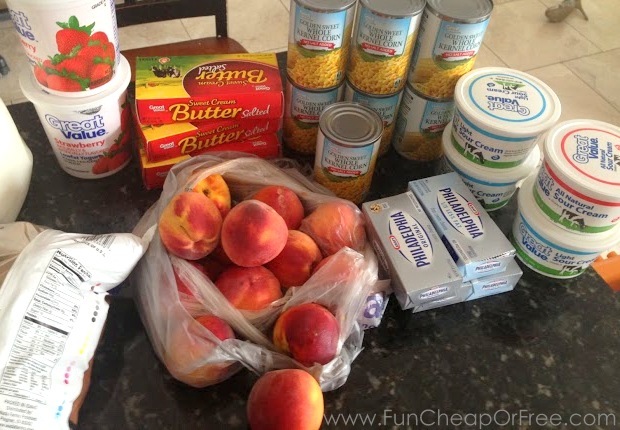 Make your meals from scratch (no store-made meals, please!! ), but be sure to plan some “eating out” days (ours is usually Friday and/or Saturday nights). Don't forget about our free meal-planning printables HERE. Cook with what you have rather than buying what you want or need. Don't have the ingredients you need for a recipe you want to make? Don't make it! Again, cook around what you have, and only buy what's on sale. I like AllRecipes.com because you can search recipes by ingredient. 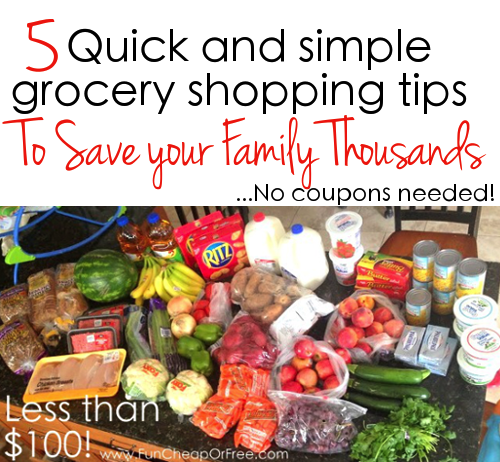 See a full run-down on how I save about 1/2 on my groceries each week without clipping coupons HERE. Of the 5 things, how many do you actually do regularly? Repetition is the best way to learn, friends! Now…for those of you who DO coupon or who like to occasionally coupon, I can't leave you out! You guys really do have the best of both worlds, because you can use your coupons AND price-match. For you guys, I recommend a coupon clipping service. It really is a win-win because it allows you to use the benefits of coupons, without making it a full-time job! 🙂 Check it out, it's really a cool concept. You will notice that if I find a good deal on something, I almost never buy only one of that item. I buy several and use them up before they go bad (by planning my meals around the items), or I freeze the extras and use them for later. So there you go! Once again, PROOF that eating well and saving thousands doesn't have to be hard. Or taste gross. 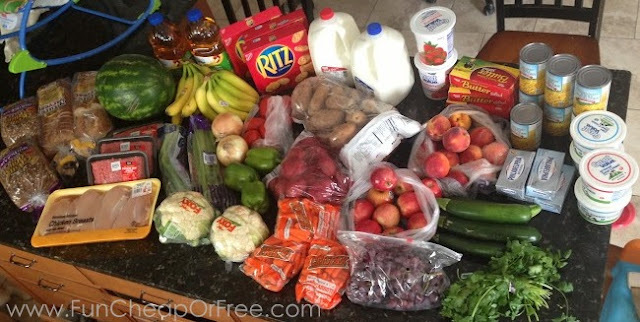 I’d love to see the menu for this week’s worth of groceries…can you do that sometimes to post the picture and the menu? wondering what I’d be making with all the containers on the right and cream cheese. Sure! The thing is, much of it I don’t use that same week. I keep one container in the fridge, and freeze the rest. I can then use the thawed sour cream in casseroles, soups, and other things that require sour cream when baking (you wouldn’t want to dollop it on top, the texture changes once frozen). 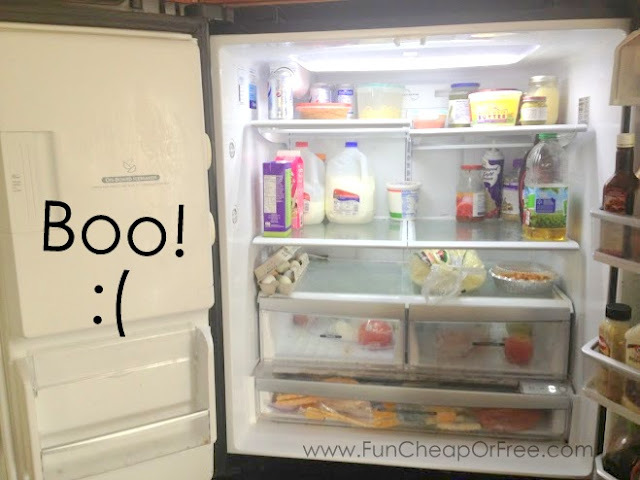 You can even freeze cream cheese! Hi, Jordan! It looks like Dealstomeals doesn’t include WinnDixie in their weekly deals. 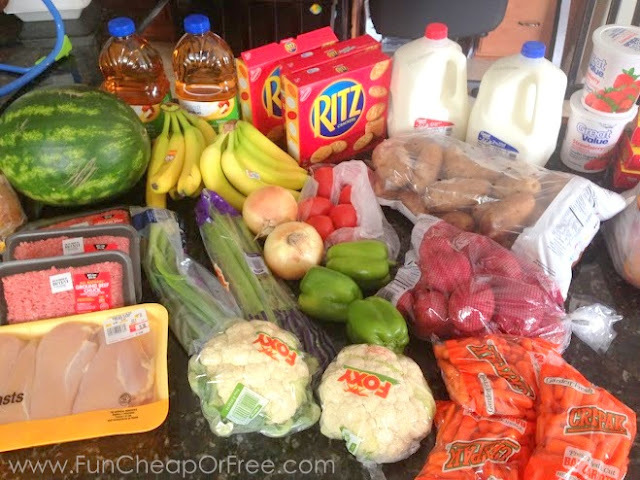 It’s one of the biggest competitors to walmart in our area (along with Publix), and they offer a lot of BOGOs… Do you think it’s still worth it to me to use their service if I only have Publix and Walmart ads to use? Thanks for all the great tips! Can’t wait to get started! Lindsey, email them!! They are so good about adding stores in your area upon request. There are thousands of stores they have to add, and while they are adding new ones every day, they will bump your requests up to the top of their list. So give it a try! I’m sure you are aware of this now but I haven’t seen it mentioned… Wal-Mart has that incredible Savings Catcher option on their app. It is amazing and I never have to worry that I could’ve paid less elsewhere. I’ve saved loads using it. Yes! It’s so convenient! I’ve used it several times and have never made money back, even though I know there were lower prices at local stores. So it’s not fool-proof but I feel confident it will get better and better over time. I’m grateful they made it so easy to use! Jordan , quick question about walmart price matching for example if another store was selling their own brand chicken for specific price per pound will walmart allow you to purchase their brand of chicken for the same price or does that not work because they are 2 different brands?? How do you go about price-matching? There are always great deals going on at different stores but I don’t want to have to run to all of them to get them. What stores accept price-matching? I’m not sure if it’s all Walmart’s, but ours has a sign at each check out saying, “We no longer offer price matching.” I live in a very small rural area where there is literally just a Walmart and our local grocery. The next city is 2 hours away. Yes! This stinks! I do however practice the art of browsing the weekly sale flyer from our local grocery, (closer than Walmart is), and plan our meals around sale items. I’ve been doing this for years. I don’t know why anyone wouldn’t do this. Meal planning has always been a life saver in our home, where my husband and I successfully raised 3 sons. They are grown now, with families of their own. My husband and I still meal plan. 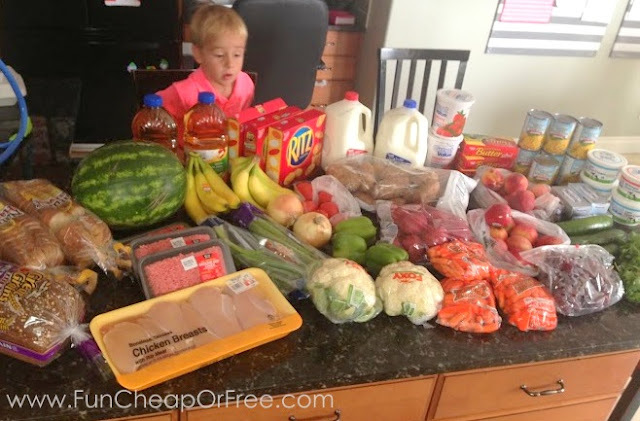 I also meal plan and shop for our middle son and his family, as he and his wife have very busy careers that don’t always allow them the time to do it on their own. This is a job I love! I want to thank you, Jordan, for doing what you do. You are an inspiration to many! Yay! So excited to implement this while shopping!